Is this really the best singles TLC match in WWE (before the WWE Network’s 100 Best Matches…List was published, obviously!)? Of course, the heavy hitters are further up the WWE Network’s 100 Best Matches…List, but they are tag team TLC matches. I’m not dismissing this TLC match pitting John Cena vs Edge at all. It’s a good bout, probably one of the best that the two had during their memorable feud. But it’s dragged down by being little more than a spotfest and Cena’s underselling. Edge is also guilty of underselling, which undermines the great effort put into this bout. 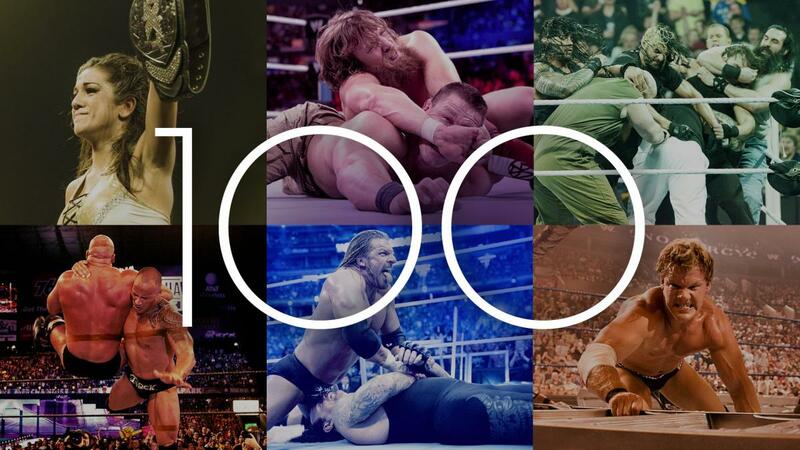 I just don’t think the match deserves to be on the WWE Network’s 100 Best Matches…List. Edge and John Cena had one of the best feuds of the mid-2000s. It all started when Edge cashed in the Money in the Bank contract (he was the first one to win the contract and cash it in!) to defeated a battered Cena at New Year’s Revolution 2005. This was at the time Cena received vocal boos from the live crowd even though he was a face. Facing opponents like Kurt Angle, Chris Jericho and HHH only emphasised the hostile reception Cena faced from the crowd. However, Edge managed to turn those boos into cheers, a great feat in itself. It’s just another example of Edge’s greatness as a heel. They had good matches together, and the TLC match at Unforgiven 2006 that ostensibly ended their feud was probably their best match. There are enough big spots to entertain the spot hungry fan in the match. The two assemble a normal wrestling match for the first few minutes, until the chairs are brought out and Edge gives Cena an inverted DDT on a few unfolded steel chairs. From that point, they batter each other with chairs, put each other through tables, and slam each other on to ladders. It pretty much follows the basic outline for a TLC match. Edge innovates a few memorable spots in the match, such as a dropkick onto a ladder into Cena from the outside barrier and a crossbody onto Cena outside, who’s holding a ladder. Edge takes the brunt of the punishment, but Cena receives his fair share of brutality as well. Seeing Cena pushed off a ladder (by Lita, not Edge) and fall through a table on the outside must have satisfied those fans who were sick of Cena being forced down their throats. On this day…I can see John Cena! But a few things let the wrestlers down. There’s a minor botch early on in the bout, where Edge goes for a sunset powerbomb through a table but either Edge or Cena mess it up, so Edge has to powerslam Cena through said table. Towards the end of the match, Edge and Cena fail to sell their beatings well enough. After the aforementioned fall caused by Lita, Cena quickly gets up to stop Edge climbing the ladder. Edge is then pushed off a ladder and falls through a table. His recovery is just as quick as Cena’s. It’s understandable for Cena to undersell, but Edge? It devalues the spots we’ve just seen. Why not tell the story of a brutal match sufficiently? Not only that, but Cena telegraphs the end when he puts a table on top of another table after it fell off. He looks confused for a while after that. Like I said, it’s a worthwhile match to watch. It takes place in Canada, so the crowd’s love of Edge and hatred of Cena works into the storyline. There’s the bare amount of storytelling in the match to compliment the big spots, and most of the big spots are satisfying enough. However, I’d point to the TLC match between CM Punk and Jeff Hardy at Summerslam 2009 as a superior replacement for #33. It has a great story behind it (part of a great feud) and a great story behind all the big spots. It feels so much more than a spotfest, something which Cena vs Edge sometimes fails to do. But then again, it deserves to be high up the list for the best TLC matches in WWE history. VERDICT: 7/10. A spotfest with a decent story behind it stutters towards the end with a bad case of underselling by both wrestlers. There’s nothing wrong with a spotfest, and Edge and Cena have some memorable big spots. But I prefer the TLC match between CM Punk and Jeff Hardy. Compare and contrast that one with this one! Previous Article Does Bray Wyatt Really Deserve A World Title?